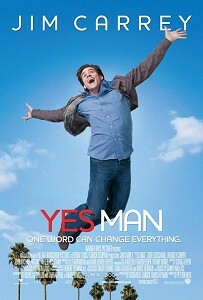 Yes Man is a 2008 British-American comedy-drama film directed by Peyton Reed and starring Jim Carrey. Bank loan officer Carl Allen (Jim Carrey) has become withdrawn since his divorce. An old colleague suggests that he goes to a motivational "Yes!" seminar with him, which encourages its attendants to seize the opportunity to say "Yes!". During the film Jim Carrey wears a T-shirt with impossible ring on it.